The first really extensive mining in Outwood took place in the early nineteenth century, when the Fentons opened nearly a dozen mines. These were 'day holes' with shafts of about eight feet in diameter, employing about ten men each. The coal from these pits was taken on a railway employing bullocks for motive power, down to the Aire and Calder Navigation Canal at Stanley Ferry, where it was tipped into barges for distribution to Goole and Hull. In 1838 the bullocks were replaced with steam locomotives. The next pit sunk in Outwood was in Ouchthorpe Lane. This was purchased by Robert Hudson & Co, who extended it and sunk new shafts to form Newton Lane End Colliery in 1853 to 1855. This colliery was typical of many in the mid-nineteenth century, with a crude wooden head gear, a brick engine-house, and a collection of ramshackle workshops spaced around a chimney and an air shaft. By 1896 all the coal had been worked out from the pit, and it was sold to the Victoria Coal & Coke Company, who filled the shafts and sold the site for housing. Lofthouse Colliery was sunk in 1873 to 1877 by the Leeds and Yorkshire Co-operative Coal Mining Company, who held. the land, on a thirty-one year lease. 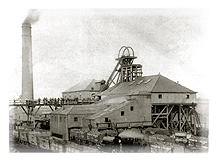 On the termination of this lease the colliery was sold to the Lofthouse Colliery Company who held. it until nationalisation in 1947 .Since nationalisation many improvements both in coal-getting techniques and working conditions have taken place. The trades unions in the coal industry appear to have had very difficult beginings; there was little hope of holding strikes to obtain better conditions without funds to support the strikers. To overcome these difficulties the Yorkshire Mine-worker's Association organised the 'Nipsy Fund'. This was an arrangement in which all the surrounding colliery union branches would, contribute to the support of strikers and their families at a colliery where a strike was being held. The local unions appear to have been most active during the General Strike of 1926 where they organised soup kitchens and fund raising activities to help the strikers. Since then however the unions appear to have worked mainly for the improvement of working conditions,including pit-head baths, and free tools and explosives (which formerly had to be purchased by the miners". Seven miners were trapped in Lofthouse Colliery when the seam they were working on became flooded. A rescue mission went on for six days, one body was recovered but six were left behind. Lofthouse Colliery closed in 1981.